This issue provides great insight on the growing and important role of the planned giving professional. Authors discuss the importance of these professionals accepting and asserting leadership roles in the complex gift planning process, thereby educating advisors in the process. They emphasize that the planned giving professional must expand from estate planning to "life and legacy planning" and become well versed in both technical information and skills needed to maximize the donor's interest as well as be able to build healthy relationships with donors and potential donors. The proposed IRS regulations on required minimum distributions are thoroughly discussed as well as the special challenges involved in retirement benefits. For individuals planning major charitable gifts, this issue helps define which assets can produce substantial tax savings. Authors also examine the beneficial role of consultants. as well as present an overview of where future planned giving professionals will come from and what skills they will need in order to succeed. This is the 30th issue of the Jossey-Bass series New Directions for Philanthropic Fundraising. GORDON D. CHAVERS is general counsel in the Purdue University Development Office. Editor's Notes (Gordon D. Chavers). 1. 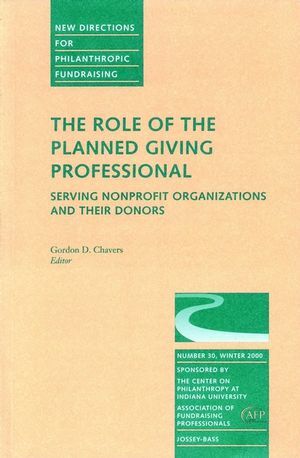 The role of the prospect's other advisers in the planned giving process: The charitable lead trust as an example (Eric A. Manterfield). 2. Creative uses of retirement plan benefits in charitable planning (André R. Donikian). 3. Retirement plan gifts and the proposed regulations on required minimum distributions (Leo C. Hodges). 4. The role of consulting in planned giving programs (Jack F. McJunkin). 5. Life and legacy planning: The evolving role of the planned giving officer (Stanley Weinstein, Steve Ross). 6. Where are all the planned giving experts going to come from? (Lona M. Farr).